Rocket mass heaters use up to 80% less wood. A rocket mass heater is a space heating system developed from the rocket stove, an efficient cooking stove invented for and introduced in developing nations in the late 80's and early 90's to decrease fuel usage and smoke emission. The Rocket mass heater is a hybrid with elements of this efficient wood burning stove and a masonry heater. 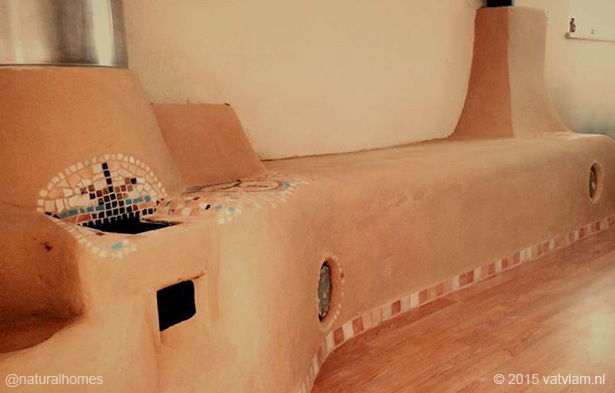 In contrast to the masonry heater, which requires advanced masonry skills, the rocket mass heater can be built by any enthusiast with basic masonry and engineering skills. A rocket mass heater can usually be put together using recycled and natural materials such as cob, bricks, rocks and a metal barrel or cylinder. The wood is vertically fed by gravity into an �L or J shaped� horizontal burn chamber [see A right], from where the hot burning gases enter a heavily insulated vertical secondary burn chamber [see C to E], passing through a metal cylinder or barrel which allows for direct radiant heat. The hot gasses then pass through horizontal ducting embedded within a massive thermal storage [see F to G] which absorbs the heat for gradual dispersion. The thermal storage is large enough to retain heat for many hours or even days and typically forms part of the structure of a building. Rocket mass heaters have proven to be popular with natural builders within a permaculture design. They are mostly self-built and therefore not yet recognized by all building codes. 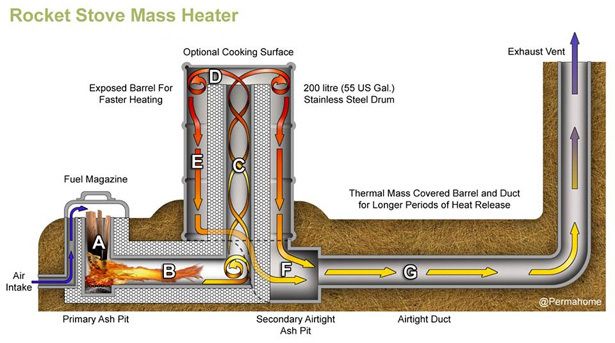 The rocket mass heaters work on the same basic principles as a masonry heater. A fast, high heat and oxygen rich fire burn up the volatile gases and particulates, leading to a very clean combustion and turn a large portion of the fuel into usable heat. In a well designed system smoke is released only during the first minutes of a burn, until the temperature in the burning chamber is high enough to burn all gases. The major difference in the design of a rocket mass heater in comparison with a masonry heater is that the rocket heater has an insulated J or L shaped combustion chamber which forces the fire to burn horizontally. This leads the flame to a 90 degree angle at the end of the chamber which causes a strong turbulence [between B and C] and secondary combustion while rising up into the insulated secondary burn chamber also known as heat riser [C], creating a forceful draft which enhances the intensity of the fire even further, allowing combustion of all unburned materials and extremely clean exhaust gases.